44 pp. Roman, 500 pp. 3 colour illustrations, 7 diagrams, numerous tables and charts, with CD-ROM: plus Appendix A 182pp. and Appendix F 55 pp. The Symposium Text in Context: African Languages between Orality and Scripturality took place at the University of Zurich from October 17 to 20, 2001. The major topics were: multilingualism as a resource for meeting the needs of African societies in the 21st century, and its implications for democracy, development, and education; African languages in the context of modern communication technologies; oral tradition and orality as a key to creativity in African art and literature. Further highlights were: African Languages and African Football – a Literary Competition and Public Round-Table on Multilingual and Multicultural Education in Africa and Europe in the 21st Century. The present volume includes more than half of the total number of papers that were read at the main session. 54 papers were chosen for publication. Part F of the CD-ROM features the special Jury’s selection of poetic texts submitted by African writers in response to the competition on African languages and African football and the texts of some speeches held at the conference. Quel avenir pour les élèves malgaches d'aujourd'hui? Un cas de francophonie nord-africaine – à quoi sert le français au Maroc? Africa's Role and Share in the Way from Oracy to Literacy – One Way or Return Ticket for not yet fully Globalized Cultures? 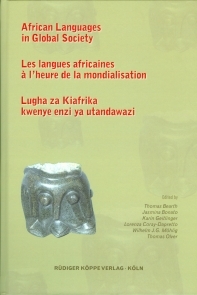 Sifa za kisarufi za tahariri katika magazeti ya "Mtanzania" na "Majira"
Le volet linguistique de l’oeuvre de Cheikh Anta Diop – quel héritage aujourd’hui pour le développement de l’Afrique? Y a-t-il un avenir pour l’Afrikaans? Construction de la relation intersubjective à l’aide des particules de discours – le cas de l’Akan s? Brothers, sisters, and noun class typology: what is special about Niger-Congo?